As per the reasons outlined in our below posting, Option A was the preferred option for the Petition Organisers, GERA and the community. For: Crs. Sounness, Okotel, Lobo, Delahunty, Esakoff and Magee (and against Option B). Against: Crs. Pilling, Hyams and Lipshutz (and for Option B). GERA congratulates Council for this decision and the Petition Organisers for their significant efforts in highlighting the issue and striving for this outcome. No doubt further efforts, related to providing additional information to Heritage Victoria and preparing for the Planning Amendment Process will again require significant efforts on the part of the Petition Organisers. GERA will continue our support and urges readers and residents to do likewise. PS. Urging the inclusion of a Vegetation Protection Overlay (VPO) for the identified, yet again overlooked, significant trees would also be a good idea. 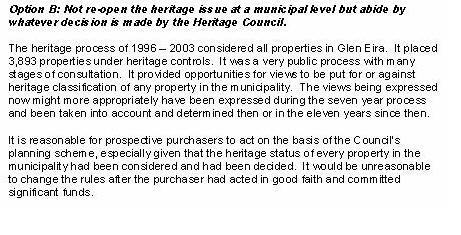 The agenda for the this Tuesday’s (3/2/15) Council Meeting includes item 9.2 – 1 Wahgoo Road Carnegie – Heritage Assessment (2015 02 03 EXTRACT of Council AGENDA and relates to Frogmore House (refer GERA’s previous post). differs with Council’s 1996 – 2003 Heritage Survey which although recognising Frogmore’s “local significance” determined that since the building was not within an identified historic area it was not recommended for inclusion the resulting heritage overlay. With regards the differences in date of construction, the organisers of the petition have advised GERA that additional 1850 – 1860’s documents, contained in the Lyall Family Archives, will be submitted to Heritage Victoria for inclusion in their assessment of Frogmore House. This documentation reportedly includes comments on the house and tower that closely aligns with that which currently exists and, therefore, supports the “linkage” to Lyall and Reed. The documentation also supports their contention that although Archibald McLaurin may have altered the house he did not demolish and rebuild Frogmore. If accepted this documentation emphasises Frogmore House’s significance at the State Level. While GERA still congratulates Council for initiating an Interim Protection Order on Frogmore and undertaking the a professional heritage assessment, GERA is concerned about the comments and recommendations included in the submitted Officer’s Report. 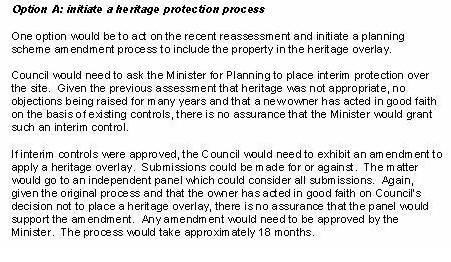 The Report is not focussed on the key issue of heritage – is Frogmore House of historic significance to Glen Eira and does it warrant heritage protection? 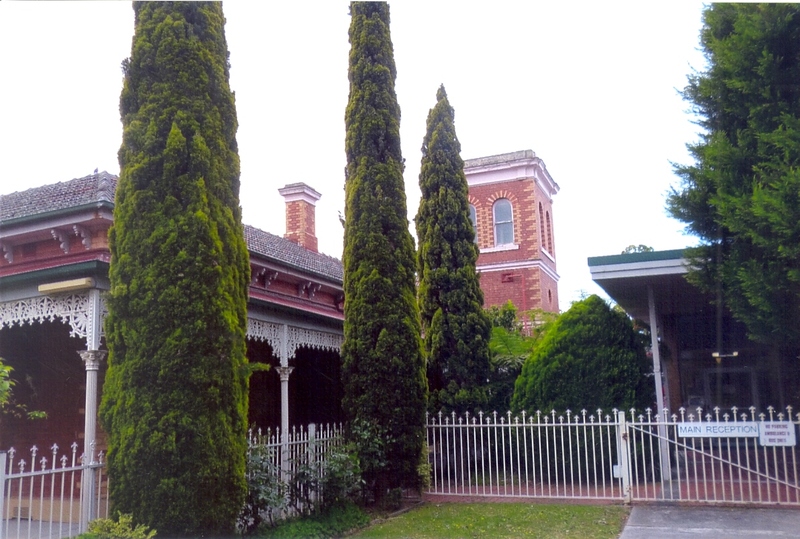 The independent heritage assessment clearly identifies the municipal significance of both the house and three trees and recommends heritage protection, by inclusion in the Glen Eira Planning Scheme. the differing heritage findings of 1996-2003 Heritage Survey (which did not consider historical associations of the property) vs. the current (February, 2015) heritage assessment (which did consider historical associations) and various mentions of no objections to Frogmore’s exclusion being received in 2003.
planning issues (eg. land size and proposed land use) which are more appropriately addressed during the planning permit approval process. With regards the Officer’s Report, the analysis associated with these issues is apparently slanted to a total redevelopment of this large (approx. 8,000 sqm) site – the opportunity that a site of this size presents for a redevelopment that incorporates a historically significant house is not mentioned. Likewise, no mention is made of significant trees. the site’s recent change of ownership and that the new owner acted in good faith in committing significant funds on the basis of Council’s planning scheme – no mention is made that both the Vendor Purchasers Statement indicate that the proposed sale was conditional upon receiving planning approval or that to date, as per Council’s Planning Applications Register 2,no planning permit application has been received. While changes to the announced conditions of sale are entirely within the rights of the contracting parties, it does raise serious questions re the validity of disadvantage to the purchaser being included in the Officers Report. As a general rule, heritage protection works on a “top-down” basis (if a property is significant at the national level then it is also significant at the lower levels) rather than a “bottom-up” basis (if a property is significant at the local level it does not necessarily follow that it is significant at the higher levels). If the assessment records the property as being significant at the State Level, then heritage protection will be applicable at both the State and Municipal Level. Thus, the planning scheme amendment process can be halted. Readers should note that the planning scheme amendment process, is by the “nature of the beast” and regardless of the request, a lengthy process with varying degrees of certainty. The heritage advisor’s report justifies the amendment and, as such, should reduce the uncertainty mentioned in the Officer’s Report. The community consultation, incorporated in the amendment process, ensures that all interested parties (stakeholders) have input into the outcome. Planning authorities have a responsibility to ensure that planning schemes have a sound basis. There should be good reasons when … expert advice is disregarded but none were provided in this instance. … Council responded to the query from the Panel about why the Council did not accept the expert advice provided by stating that Council may form its own view. It would set ‘a dangerous precedent’ if a strategic designation for more intense redevelopment was deemed sufficient justification for removing (or not adding) heritage overlays. The protection of heritage values remains a valid planning consideration in planning decisions. Widely spread, unconfirmed rumours indicate this option is recommended by Heritage Victoria. Is in line with the Municipal Association of Victoria (MAV) – Councillor Training Program‘s recognition that Questioning and Challenging Officers Reports is an integral part of a Councillors role. Both the 2011 Amendment C83 and this current issue indicates a review of the 2003 Heritage Assessments and associated administrative processes are warranted. This is an issue which is not addressed in the Officer’s Report. GERA and many members believe that this is an unfortunate situation that may involve a significant disadvantage to the purchaser of the 1 Wahgoo Road, Carnegie. Equally, it is also unfortunate that residents were not aware that Frogmore House was not included in the 2003 Heritage Overlay. That being said, it is even more unfortunate that the wording of the Officers Report of the 2003 consultation process (exemplified in Options A and B above) is considered inappropriate and does not reflect the level of responsiveness (frequently claimed by Council) that can reasonably be expected of a Council fully attuned to the dynamic demographic, communication and social changes that have occurred since 2003.